Sometime in the recent past (I haven’t kept track, so this could have been over a year ago) I realized that the reason I was usually struggling with writing my stories was because I didn’t really know the characters’ motivations. I looked back at my stories written thus far, and found that the stories in which I figured out the character motivations early were the stories I had less frustration writing, tended to be written quicker, and I considered them to be my strongest stories – not just for understanding the characters, but plot and such too. This was a very important revelation to have, and it’s a sign that I’m growing as a writer. It’s also made it extremely aggravating to write when I don’t know the characters’ motivations. Now I know the reason why some stories are written with ease and others aren’t; my trouble is knowing how to find the character motivations for the works-in-progress that I don’t fully understand yet (which is a bit of a ‘chicken and the egg’ conundrum). Like all things in writing (and all facets of life) the hard things seem hard and nearly impossible until you’ve done it enough that it feels easy, or at least doable – and often that doesn’t come until some new hard thing reveals itself and then you stress over improving that. Still, there’s no way around it, is there? Shining a light on our weaknesses is the only way to make the changes we need to improve. Where’s my Shape Up Saturday? No post again this week, folks. Lately I only have time for blogging OR writing stories. I’ve got to pick one for a while. I’m hoping that after the middle of December I’ll have more time to devote to writing in general, but until then all my posts will need to be ones that don’t require oodles of research and carefully inserted photos and videos, which is how I’d prefer to do the Shape Up Saturdays. So until then, I’m putting Shape Up Saturday on indefinite hiatus and will be writing less stress-inducing posts. I’m feeling quite accomplished and homemakey tonight. 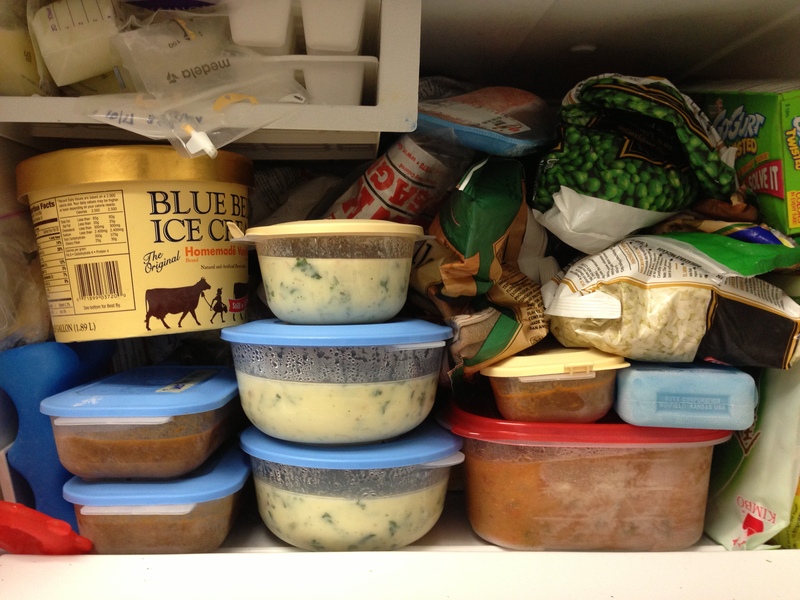 I just made a HUGE pot of potato and kale soup and portioned it and labeled it and put most of it in the freezer. It’s joining several containers of sweet pork as well as vegetable soup. I also have a pot of pinto beans and a pot of black beans soaking, ready to be boiled tomorrow and also go into the freezer for future projects (like tasty, tasty sweet pork burritos). I’m doing this because I’m determined to 1) have more time to write instead of feeling concerned about not having dinner ready, and 2) to be prepared for the near future when I’ll need to be on an even tighter budget. I feel the need to get the hang of cooking on a budget NOW when mistakes can be financially forgotten easier. Did you know that a dry bag of beans costs .88 and makes 4x the portion of a can of beans, which costs around 1.10? Yes, it takes some prior planning, but I’ve make some incredibly savory pinto beans with just a little bacon added and it tastes better than any can of beans I’ve ever eaten. But for now, the biggest bonus (besides cooking with fresh ingredients which is AMAZING and way healthier) is giving myself more time to write. You may have noticed (or not, I understand if you don’t hang on my every word… yet) that my Shape Up Saturdays aren’t arriving each Saturday. That’s because I can’t keep up with all the demands on my time right now AND present a well-explained post for each body issue I’d like to cover. I’ve considered just posting a picture or short video of one pose or exercise to try each week. Would this be helpful? You tell me in the comments and help me decide where to take my Shape Up Saturdays from here. In the meantime… I’m off to take a few minutes to write.